The Amazon River flows east across the continent of South America, dumping vast amounts of water into the Atlantic Ocean each day. But at one point, the river actually flowed from east to west and, for a time, in both directions at once. When the continents of South America and Africa broke apart this created a raised highland along the east coast of South America, which tilted the river’s flow toward the center of the continent. 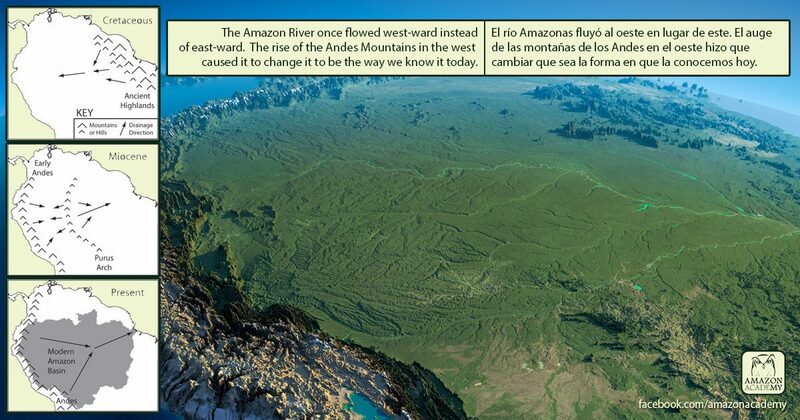 The Andes Mountains on the west of the continent grew larger over time and eventually became large enough to send water and sediment over the Purus Arch, a central ridge which was once a divider of the Amazon River systems. By this time, the eastern highland had eroded away, and the river’s water could empty freely into the Atlantic.